Boston Handmade members Linda Dunn and Dawn Wilson have their work represented in the Women of the Cloth Exhibit. 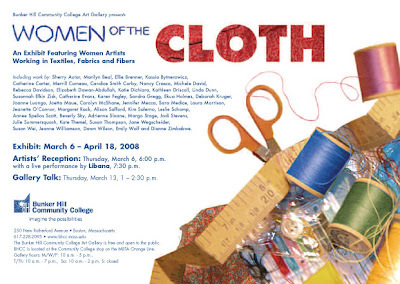 The exhibition runs from March 6 - April 18, 2008 at Bunker Hill Community College. The Artist's Reception is TONIGHT, Thursday, March 6, 2008 starting at 6:00 pm with a live performance by Libana at 7:30 pm. Linda Dunn is represented by two works "Angry Quilt" was a response to a diagnosis of breast cancer, and "One Way" is about the journey through old age towards death. Dawn Wilson's quilt titled, Affirmation will also be exhibited. Linda's work can be seen on-line at All Dunn Design and Dawn's work can be seen at creatively anew any time day or night!